Want to find out more about all on 4 dental implants cost? The all on 4 implants procedure offers a permanent and lasting tooth replacement and is growing in popularity as an alternative to removable dentures. Using only four dental implants enables your dentist to provide replacement for up to 14 teeth using only four dental implants. Ultimately this means a shorter procedure at a lower cost than using single implants. The all on 4 procedure allows you to replace an entire set of teeth using only four dental implants. The dental implants are usually made from titanium and they are screwed into your jaw bone to provide permanence and comfort in order to work and look just like your natural teeth. The artificial crowns (usually between 10 and 14) are placed together. Four of the crowns will be attached to your implants while the others are joined to each other. How Much Is All On 4 Dental Implants? 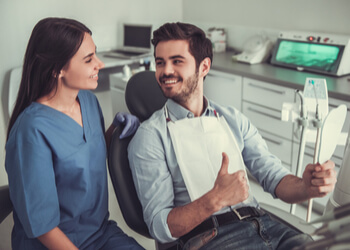 The cost of your all on 4 dental procedure will be based on a number of variables that include where you are based, the number of teeth you need to have replaced and the kind of materials that your dentist will use. According to smile.com.au you should expect to budget in the region of $23,000 to $27,000 for a single fixed arch. This price is quite comprehensive and will include your initial consultation, the pre-surgery procedures, the surgery itself, your reviews following treatment as well as your x-rays. Finder.com provides a bigger price bracket, advising patients to set aside between $15,000 and $30,000 for the procedure. These figures are for a standard procedure that is relatively straightforward. If you do not have enough jaw bone to support your dental implants you may need a bone graft, which increase the cost of your all on 4 procedure. If you require an upper and lower all on 4 dental procedure and have them both done at the same time, you can expect to pay less than if you had each surgery performed separately. How Does The Cost Of All On 4 Dental Implants Compare To Single Dental Implants? A single straightforward dental implant can cost anywhere from $2800 to as much as $5500. The all on 4 procedure offers a more cost-effective way for patients to replace their missing teeth. How Do All On 4 Dental Implants Work? The all on 4 procedure requires a great degree of skill to perform and is highly effective because of the angle at which your implants are tilted. It is their 45-degree angle placement that allows them to provide support to an entire arch of teeth. This tilting also often means that bone density is not a major feature in determining whether you are eligible for implants and in many cases, allows the patient to avoid being in need of a bone graft. Will my insurance cover my implant procedure? Most policies exclude dental implants from being covered but sometimes you can claim from your hospital cover if you are admitted to hospital and have the procedure performed as an inpatient. Your other option is to look at your extras cover to see if your policy offers periodontic cover and doesn’t specify implants as exclusions. If this is the case, make an enquiry with your insurer and find out if there are any out of pocket costs to consider.